Our ground-breaking campaign to bring an end to animal circuses and rescue each and every animal from a lifetime of suffering. The gargantuan task to end circus suffering in Bolivia started six years ago, when ADI field officers first exposed the cruelty in South American circuses. The shocking footage swept the continent, and in Bolivia the public were horrified by the conditions the animals were forced to endure. The exposé led to an educational and political lobbying campaign that gained early victories with animal circus bans secured in key cities and then after many attempts, the new law ending the use of animals in circuses was secured on June 17, 2009. One circus voluntarily gave up their animals ahead of implementation of the ban, and ADI moved this first family of four lions to California, and a Hamadryas baboon to the UK in August 2010. We then began drafting regulations to enforce the new law, and conducted a census of all animals. In November 2010, ADI undertook search and seizure operations on Bolivia’s circuses with the support of the authorities and in less than three weeks we had removed all of the animals – including 25 lions! – from every circus in Bolivia. We established a reception centre and nursed the lions back to health, ahead of their journey to a new life in the US, where construction had begun on a huge biosphere to house them whilst they acclimatised to their new environment. In February 2011, the record-breaking airlift took place and our big cats were safely transported to the sanctuary in Colorado. 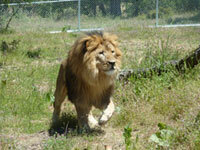 As the lions settled into their new environment, work began on their outdoor enclosures. By the autumn all of our prides had been released into four massive natural enclosures covering 80 acres which they can now enjoy for the rest of their lives. From launch to legislation, ADI’s Stop Circus Suffering campaign. Read more here. Ahead of the ban, how the first circus handed its four lions and baboon over to ADI and were taken to sanctuary in the US and UK. Read more here. ADI‘s seize and rescue mission of Bolivia’s circus animals and the rehabilitation and relocation of 25 lions who now enjoy freedom in Colorado. Read more here.